In early 2016, I ran across a fabulous article about Idea Debt by Jessica Abel. It was one of those “whack on the side of the head” moments for me then – and is just as applicable today. Oh boy. I knew exactly what she was talking about. As I read Jessica’s post, I found myself transported back about 4 or 5 years. The trends were changing and business was not as good as it had been. I needed to make some changes, and I came up with the idea of creating an online learning program. But this was not going to be just any online course. Oh no! It had to be a Big Fancy Amazing Online Program, complete with Webinars and Live Streams and every other fancy-shmancy online gimmick available. It was going to be Big, Big, BIG! But you know what? It never happened. I got so wrapped up in the planning and the packaging that I was totally burned out and pulled the plug on the whole thing. My big idea became a big pile of Idea Debt that dragged me down for the next couple of years. I was paralyzed at the thought of actually teaching online until I was able to let go of the idea of creating a Big Amazing Online Experience. I was holding onto that Grand Idea so hard that I couldn’t simply let myself start small. If you’ve been with me for a while, you know that I got over that disaster. I’ve been teaching online courses for several years – and literally, having the time of my life. In theory, I should be able to say that I’ve whipped that Idea Debt monster. Right? Well, not exactly. Can you relate to that somewhere in your life? Do you have a Grand Plan about something that’s so big that it keeps you from taking the first step? Yes? You’re not alone – and I have a 7-Step Solution, just for you. I want to “appliqué” designs with paint instead of fabric. I want to learn to draw and cut my own stencils. I want to teach a class on topic ABC. Is there a class about the thing you want to do? Has someone written a book about it? Set aside some time to track down the resources that might be helpful. Ask your friends for recommendations. You don’t have to start from absolute zero and learn every hard lesson the hard way. Finding the class is not enough. Get yourself signed up. Buy the book. Book your flight to the conference. Whatever it takes to learn what you need to learn, just do it. I hate to break the news, but it is not enough to sign up for the course or buy the book. You actually have to do something with the resources you purchase. Remember? Less Thinking, More Doing. And while you are doing, keep it small. Nothing says you need to make a huge project out of each lesson. Nothing says you have to love what you make as you learn – or turn the samples into Something Finished. It’s perfectly okay to do the lessons, to try out the concepts on a small scale. After all this Doing and Making, review your results. What worked better than you expected? What things didn’t turn out the way you expected? What, if anything, landed on your “Never Again” list? 6. Make a “final” sample that incorporates the things that you want to take forward in your work. To cement your new-found skills into your thinking, make a final sample based on the concepts you liked the best or found the most useful. Think of it as your Graduation Project. Now, don’t go nuts. It doesn’t have to be a big, huge project. Another small sample will do just fine. The trick is to pull the concepts or elements that you like into a single piece that can serve as your starting point for future projects. 7. Let the rest go. That’s right. Let The Rest Go! By doing the lessons and making the samples, you’ll know what you want to hang onto – your “keepers” – and what to release. This releasing of the things that don’t serve you is the key. You tried it, and it wasn’t your thing. Let it go. It’s been sitting on the back burner for so long that you no longer care. Let it go. It’s something you (or someone else) think you “should” do. Let it go, let it go, let it go! If being stuck in your head is the cause of Idea Debt, then Making and Doing are the cure. Quit living in your head, stuck in all the grand plans and do something. As painter Chuck Close would say, go to work. 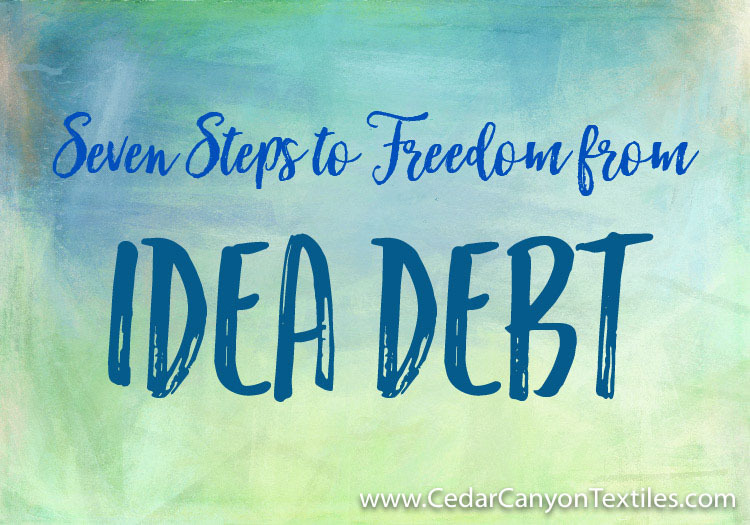 Do you have a pile of Idea Debt that is keeping you from moving forward? Have you found a way to “let go” and move on? Leave a comment below. I would love to hear what you’re thinking. Thanks so much for revisiting this! 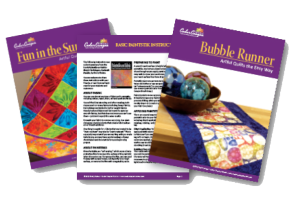 I have had two ideas for quilts in my head for a couple of years. Reading your post today has helped me to organize the first steps for both quilts, one of which uses paint stick medallions. Now I am eager to get started! That’s fantastic, Alice! I’m so happy you found this helpful. I have my fingers in too many pies. I really need to focus on the ones that matter to me! I will start by completing a number of small projects that I have been putting off for no real reason. Once they are out of the way it’s time to follow through with some major projects that will fulfill me in the long run. Onward!!! Thanks for this great article. Never put a name to what I have but now I know I have an enormous idea debt. And now tips to help me through it! You’re so welcome, Peggy. I’m delighted to help. 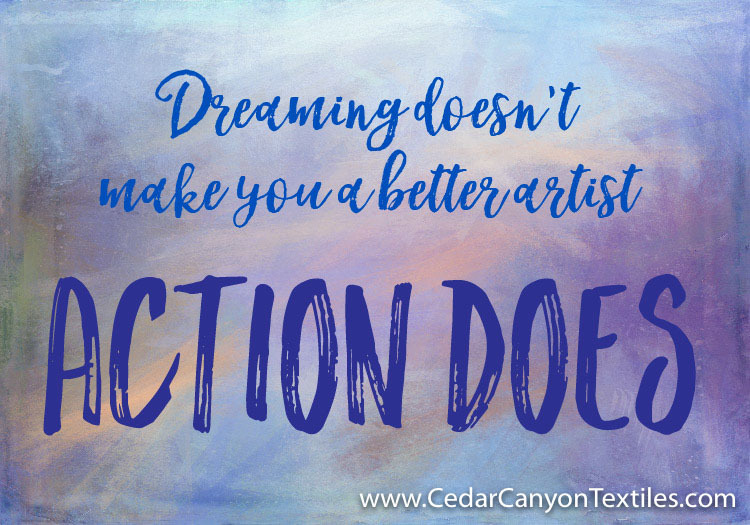 Definitely food for thought…and action! It’s something that I’ve actually been doing over the past few years without realizing it. I realized when reading your post that the times that I dread going into my quilt room to work are when I’m bogged down and don’t know what to do next to get to the vision I have in my head of what I want as the results.. But when I pack it away, or re-purpose the stuff I feel totally free and creative again! When I get stuck and just “go for it”, playing with my ideas to try them out as you suggest, I find what works and what doesn’t so that I can move forward. Those kind of discoveries are so exciting!! Currently I’ve been wrestling with a project’s design, though I have the main concept, while I’m working on 3 others that have earlier deadlines. I think that I am going to “let it age” until I’m done with the others so that I can take your advice and have some play time to see where it takes me. Adapt and conquer! You’re welcome, Mary. I love your idea of putting your design “problem child” on the way-back burner while you finish up with earlier deadlines. It will free up mental space and energy for the things you need to work on now. Thanks for the charming and well articulated reminder; these are familiar concepts for me and I try to live by them (not always successfully). Finding balance is a on-going challenge! I am very guilty of this. It’s a relief that others do this too. And apparently enough people do it as to warrant writing about solutions to it! It’s hard to keep the enthusiasm of thinking about something from running amok without slowing down enough to actually create the thing you want to do. My biggest problem: shopping for supplies that I am convinced I need before I can get started. I will try to practice these seven steps from now on. Oh… the supplies we “need” … I can totally relate to that! Good grief. The things we do to ourselves! OMG! I had no idea what my affliction was called. Now that I can name it, I can use your treatment plan to “medicate” it. Wonderful! I’m glad you were able to get going on your project. Thank you, Joy. I’m delighted that we have connected. I love Mary Corbet’s system of rotating through her projects. In a recent post, she talked about her method for keeping all the materials for each project in a bag/pouch, and having a bin (a parking place) for the projects to reside so she doesn’t have 10 things dragged out at once. I read it all. It definitely hit home. My house and sewing room are such a mess that I don’t know where to begin to clean it up. Until it is straightened up, I am getting only “have tos” done. I so want to “create” something. I thinkyour article will help me get started. You’ve got lots of company, Susan. My studio was two steps short of a disaster when I started my SlimDown program a couple of months ago. Start with one pile. Then one more. One step at a time! Thanks Shelly. I have this illness and this is great to see how to cure it. Love all the tips. Thanks for sharing.